"Order before 12pm and your order will be dispatched same day (Mon-Fri only)." Delivery : Remember! We deliver any size order for only £4.95. No Quibble Returns : If you are not completely delighted we will exchange the item or refund your money. Not yet rated. Be the first to Rate The Product. 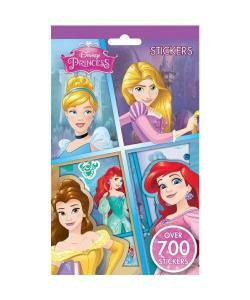 If you are a fan of Disney Princess you will love this sticker pack. There are 9 sheets of colourful stickers which gives you over 700 stickers to use. Decorate cards or party invitations for your friends or brighten up a scrap or exercise book.